Gadfly Records is proud to announce the release of Long Story Short, from veteran singer/songwriter and Brit-pop legend Clive Gregson. In his 25 years in the music industry -- through pop-rockers Any Trouble, and his associations with Richard Thompson and Christine Collister -- for British folk/rocker Gregson it’s always been about the song. This new disc features 15 intimate portraits delivered with sparse production and a voice that cuts straight to the heart. Born and raised in Manchester, England, Clive is an accomplished singer, musician and record producer. His start in the music business was as the leader of Any Trouble, a band that made five albums and performed hundreds of gigs but which broke up at the end of 1984. Clive then released his first solo record, Strange Persuasions. The record featured the voice of Christine Collister, and between 1985 and 1992, Gregson & Collister formed a partnership that Rolling Stone called "the state of the art in British folk-rock". Throughout this period Clive was also a member of the Richard Thompson Band and in demand as a record producer and session musician. He compiled his second solo project, Welcome To The Workhouse and by October 1992 was performing as a solo artist again. In November 1994, Clive released Carousel Of Noise, a mix of live and studio recordings. The following April, Clive released People And Places, a new studio record featuring some of his best writing and performances to date. August, 1996 saw the release of I Love This Town, a CD that Clive describes as a "return to the Any Trouble sound: short, upbeat pop songs with lots of guitar...". In September, 1996 Clive travelled to Dublin to take part in sessions for a new Nanci Griffith CD, Other Voices, Too. The following February he was nominated for a Nashville Music Award in the Artist/Songwriter category and in March he undertook his first solo tour of Japan. Throughout 1998 Clive interspersed recording with yet more touring. He was shortly re-united with legendary producer John Wood, who agreed to mix Clive’s next solo project Happy Hour (released in early '99). The year 1998 ended with his appearance as a special guest on Nanci Griffiths’ "Other Voices Too..." tour. 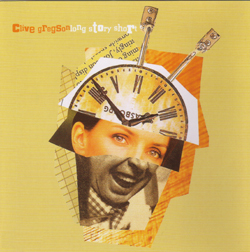 Clive’s next CD Comfort & Joy was released in 2001. Much solo touring followed to promote the album, including a trip to Japan and Clive’s first solo dates in the USA in almost five years. The warm reception for the album and live shows kept Clive busy on the road throughout 2002.